1/8 Hp capacity continuous rated 230 Volts, single phase AC operated motor along with 8″ dia impeller has been provided for uniform temperature and humidity condition inside the chamber. 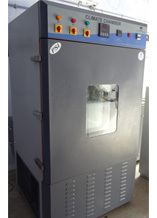 Low surface loading inconel tube heaters having capacity 500 watts-2nos. Has been provided to add heat inside the chamber. All the heaters are mounted in the conditioning space and will operate in the black zone. Low pressure moisture generator tank has been provided to generate the moisture and add humidity in the chamber. 2 KW capacity immersion heater having 1 V4 BSP threading has been provided inside the moisture generator tank. The moisture generator tank has been provided along with low water level controller with mechanical float type refilling arrangement.